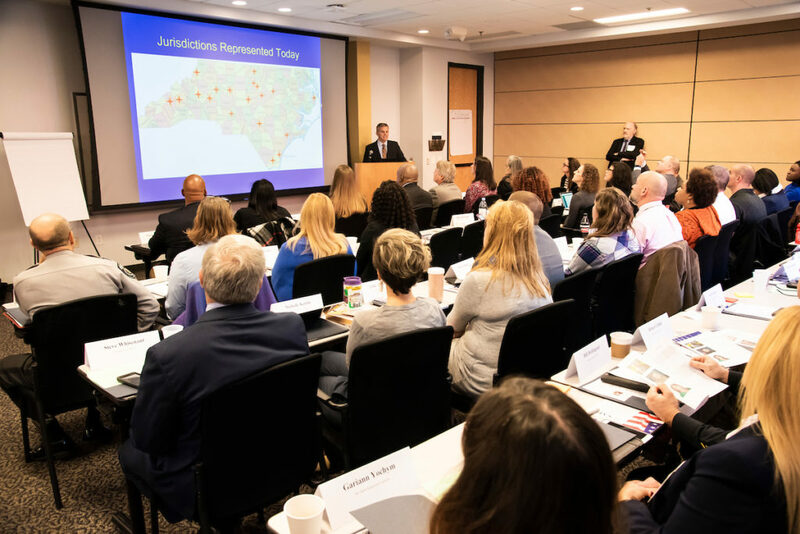 In October 2018, SAFE joined N.C. Attorney General Josh Stein & key players to discuss how law enforcement can help people with substance use disorder. The effort is called Pre-Arrest Diversion or PAD: programs focused on directing those with substance use disorder away from the criminal justice system, and directly into treatment and onto the path of recovery. The concept of diversion away from incarceration isn’t new. In fact, many PAD programs have their origins in juvenile justice and mental health interventions. Those systems learned that incarceration and criminal records did more more harm than good for juveniles and those with severe mental illness. Criminal behavior had more to do with underlying mental health issues and childhood trauma than anything else. Eventually, that concept expanded to include people battling substance use disorder. This progressive approach sees them as suffering from a disease and should be treated as such. Pre-arrest diversion to treatment for substance use disorder is thought to have begun in King County, Washington. 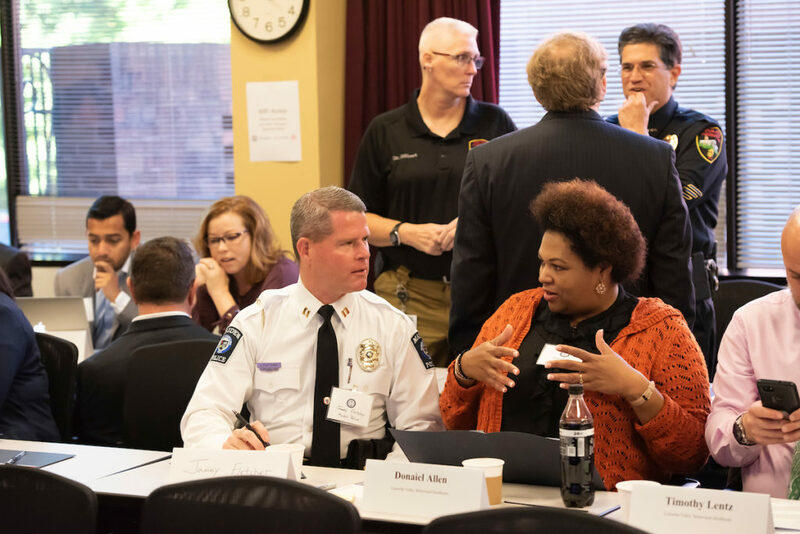 The King County program, known as Law Enforcement Assisted Diversion (LEAD), has become one of a growing number of national models in the last few years and has helped advance reform across the country. There are multiple benefits to this model. Pre-Arrest Diversion reduces overdose fatalities, promotes a public health framework while reducing reliance on the criminal justice system, and improves police-community relations. North Carolina Attorney General Josh Stein first introduced SAFE to the concept of Pre-Arrest Diversion (PAD) programs last year Stein has been a long-time, passionate advocate for PAD programs in the state. We quickly agreed that this approach to reducing overdose fatalities was one of the most innovative and impactful actions local law enforcement can take. SAFE is working with the NC Attorney General and Duke University to collect data on existing programs and using that data to analyze current programs and help make the case for other communities and law enforcement in adopting Pre-Arrest Diversion. A group of law enforcement organizations, treatment providers, and advocates have teamed up to discuss, research and scaleup these best practices on a national level. The Police, Treatment and Community collaborative (PTACC) is now working to organize and define the field of Pre-Arrest Diversion. In August 2018, SAFE became a formal member of PTACC, which categorizes law enforcement PAD programs into two types and five pathways. The two broad types of PAD programs law enforcement should have in their toolkit are Intervention PAD and Prevention PAD. Intervention programs involve law enforcement and first responders intervening during the commission of some sort of crime. This typically means there are charges held in abeyance, pending the completion of a treatment program. Prevention programs seek to target outreach to at risk populations to encourage initiation and provide pathways to treatment. Take a look at the PTACC Pathways to Community graphic below. You will see an overview of the five pathways communities can use to divert their friends, family and neighbors into the treatment they so desperately need. SAFE believes Pre-Arrest Diversion is one of the most impactful ways law enforcement can help reduce the demand for illicit drugs. 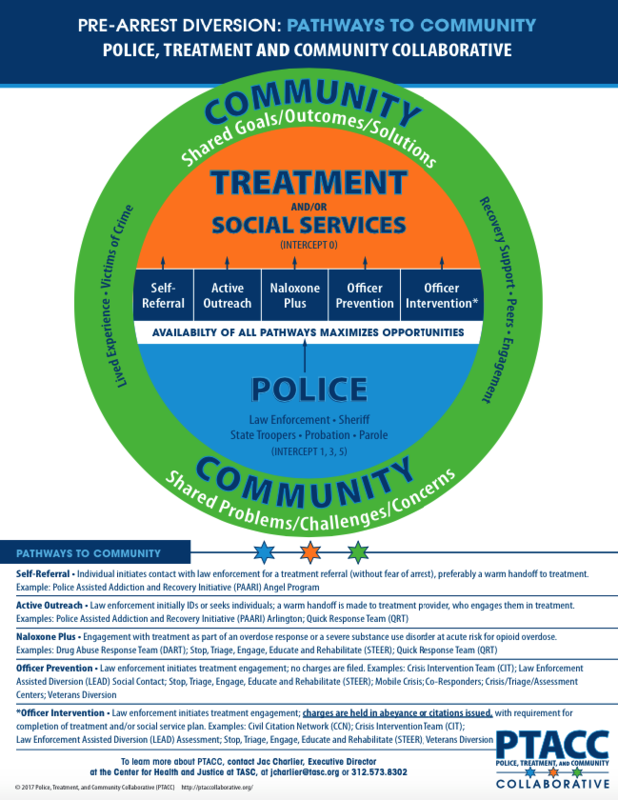 SAFE is partnering with PTACC to create a new Law Enforcement Pre-Arrest Diversion Resource Guide with specific case studies and best practices for communities.